Do you ever feel like your world is full of clutter… both mentally and physically around you? Too much of “things” aren’t good for any of us. 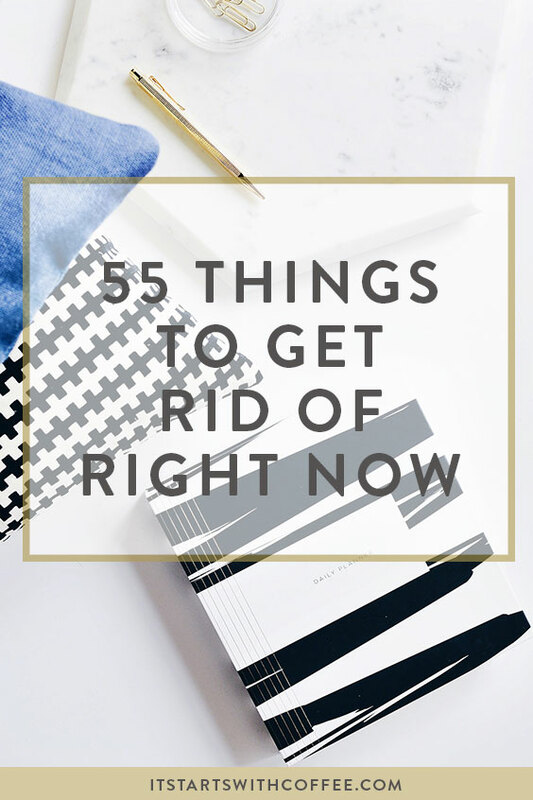 Today I am sharing 55 things to get rid of right now to make your life a little bit less cluttered. Remember, a lot of things you can get rid of like clothes and household items can be donated to charities! So when you get rid of things, take stock of them being able to be used by others. DONATE! Do you agree with these 55 things to get rid of right now? What would you add to this list? Major cleaning to do this weekend. Especially with the old stuff and my wardrobe! This list made me chuckle this morning, especially #52, because I’m wearing a pair of glasses right now that need to go in the trash! Thanks for sharing, and have a super day. I love this! Especially the tip about cutting negative people from your life! Negativity can totally weigh you down. It’s also crazy how many old phone cases we have laying around! Why do we keep these things?! Great post. Great list! I tend to hold on to way too much junk (both physically and metaphorically) and have been doing a lot of purging lately. This will definitely help keep me on track! I love that you included unfollowing people on social media and getting rid of old phone numbers, we often forget how much those sort of things drag us down and add to mental clutter! #55 is something I could use a whole lot of help with. It needs to be done, but it’s so overwhelming. Ratty blankets are my weakness. They’re always so cuddly! I need to go into my closet and purge a lot of clothing. Particularly ones that don’t fit anymore! Love this list, you’ve just reminded me I’m due for a closet cleanup asap! Funnily enough, I just got rid of old phone numbers in my phone! I also spent the summer decluttering my house! Excellent suggestions! I find comfort in purging unused items and reorganizing those areas afterward. Looks like I now have a few more things to sort through soon. I agree with all of these! We try to sell or donate all of the toys that my kids no longer use and need because they just take too much space! I am the worst for keeping ratty blankets I never use. Sigh, they definitely need to go! I tend to get rid of stuff often. My teen daughter on the other hand, is a pack rat. Since we rent rather than own a home, we tend to move every year or two and with that comes my annoyance that my daughter cannot live a bit simpler. Perhaps I will share this list with her, haha! I love this list! I recently went through my food and got rid of old and expired stuff in my pantry. I was shocked at how much I threw out! Great list! I really need to go through and pitch all my clutter. We donate a lot every year as kids out grow clothes. 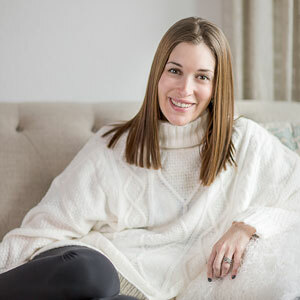 I’m in serious need of some decluttering (though most people wouldn’t think so upon looking at my place, but I may need to cross reference this list when the time comes! Getting rid of old phone numbers is something I did a few years ago (and probably need to do again). Fab list! I totally agree with all these list items, and especially about excess cups. We have way too many in our house, and it doesn’t make life easier. Less stuff is better. I need to go through and pitch stuff. I have so many clothes I don’t wear, and don’t even get me started on crumbled receipts…I don’t know why I don’t just toss them right away. i need to revisit this list once im in purging mode. YES! Declutter, I need to do more of this in my life! I love this list. I have decluttered a lot in the last year. I also need to go through my “coupon and junk ” drawer in my kitchen and throw out expired ones and ones I’ll never use. And my email inbox really needs wiped clean! And how about donating old books you’ll never read again? Oh, definitely a lot of good ones on here! I kept a lot of old phone numbers for the longest time, so it was nice to change over to a new phone in the past year or so. I was able to get rid of about half of them. YAS! I whole heartily agree with this entire list and do it every quarter. Very good reference for decluttering! I do this every time I have the chance. Glancing at your title, I thought it was a home decluttering project about to happen. I definitely do need to declutter my technology and relationships. I have to admit; I’m a total hoarder. I hate clutter, but I have trouble throwing away things. I need to purge! Wow, thanks for this list it is a pretty thorough yet helpful list to keep you clutter free! Such a useful post! I need to print out this list and follow it…so much to de-clutter! All of the above! How about old dog collars, old style lingerie, straw hats not worn in a decade, belts for outfits you smartly got rid of 5 years ago,, so much more….. This list is amazing and so so right on point. I just went through and threw out TONS of coozies the other day and have so much more on my list that falls in this list. Makes me want to throw everything out! Love this list, I have been meaning to set aside a day to declutter. This post has motivated me to do just that. Thanks! I had a plan to clean up my house for winter, but I still don’t know how many things I have to do. The list save me much time. I’ll spend this weekend to check and get rid of all things on the list. Thank you for sharing!! I had to laugh, I am guilty of water bottles rolling around in my car!